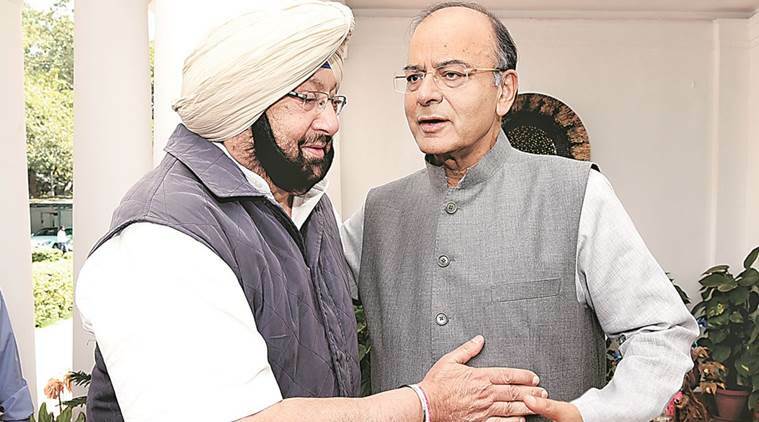 Chandigarh: Punjab Chief Minister Captain Amarinder Singh will meet Union Finance Minister Arun Jaitley in New Delhi on Thursday to pursue the issue of GST waiver on langar and prasad, as well as settlement of Rs. 31000 crore CCL related debt to ease the cash-crunched state’s financial burden. Chief Minister has already taken up both these issues with the central government but will personally discuss the same with the finance minister, according to an official spokesperson. Captain Amarinder had decided to personally follow up on both these issues in view of their sensitivity and criticality to the state, said the spokesperson, adding that other issues of state interest could also be discussed at the meeting. Chief Minister had earlier written to the finance minister seeking GST exemption on Langar (community kitchen) and the Prasad distributed at various religious institutions. Captain Amarinder had, in his letter, reminded the Union Finance Minister that Gurudwaras were exempted from the payment of VAT on goods brought by them for serving food in free kitchens (Langar). However, under the new GST regime, tax is payable on the purchase of these goods. The Chief Minister said that GST is also payable on sale of Prasad, thus impacting all religious institutions including Temples, Gurudwaras, Mosques and the Churches. Captain Amarinder had written that the levy of GST on goods purchased by religious institutions was not fair as these institutions did not have any source of income and were run and managed with finances raised through donations. Chief Minister, at his meeting, will urge the Finance Minister to reconsider the matter and exempt all religious institutions from payment of GST, not only on sale and purchase of Prasad but also on goods purchased by them for serving Langar in free kitchens run by them. On the issue of the CCL related debt waiver, the Chief Minister had also discussed the same with Prime Minister Narendra Modi and intends pursuing it aggressively, said the spokesperson. He will seek the minister’s intervention to settle the Rs. 31000 crore debt, resulting from the CCL legacy gap and the exorbitant interest imposed by the Centre for conversion of the pending CCL amount into loan. Chief Misister said debt would require Rs. 3240 crore to be spent every year on debt servicing for the next 20 years at the cost of the welfare schemes of the state, which the state could not afford and which, feels the Chief Minister, should be proportionately shared by all concerned agencies in a just and fair manner. The gap had resulted from difference in actual expenditure and expenditure approved in cost sheet approved by the Department of Food & Public Distribution (DFPD), Government of India, and the inability of the State Government agencies to fully repay the CCL, said the spokesperson, adding that the DFPD had repeatedly assured the state government to address the issue but there had been no movement on this front so far. Next articlePunjab CM Announces 10 Lakh Compensation, Police Job for Brother of Martyred.